AshleyNewell.me: My Thoughts Exactly Intro and GIVEAWAY! My Thoughts Exactly Intro and GIVEAWAY! Hi friends! I hope you are doing well! Dustin has a new schedule so we are in the middle of our weekend. It's kind of nice having him off on a weekday so we can get our stuff done without all the weekend crowds! Today, I am up on the My Thoughts Exactly Blog. It's my intro onto the design team! YAY!! I absolutely LOVE these stamps and I know that you will too! The designs are awesome and the high quality stamps are SO easy to work with! Here's a card I made for today's challenge. Alyssa challenged us to make a card that really showed off our style. Honestly, I should have made like 3 cards because I do a lot of different styles. I couldn't because the kids are so demanding of my attention right now. But I LOVE how this card turned out! No matter what style I do, a few things are always consistent with me: I use minimal embellishments, I LOVE patterned paper, and I love a little feminine touch on my projects. This card uses Holly Jolly Tags and Under the Sea. I love both of these sets and you can see how versatile they are on this card! GIVEAWAY ALERT! Alyssa is letting me giveaway my FAVORITE My Thoughts Exactly set today! Woot! Thanks Alyssa! I'm giving away HOLLY JOLLY TAGS! I love this set! It's a fabulous Christmas set but you can use it all year round! Here's how to enter. You get one entry for each thing you do, just leave a separate comment for each! That's FIVE chances to win! Giveaway closes on Saturday Jan 14 11:59pm Pacific time. Winner will be announced on Sunday Jan 15. Good luck! Lovely card Ashley. I really like the pattern paper and details in your card. Such a lovely card!!! That butterfly is so pretty on that pattern paper! Oh I love all the different colors and textures! :-) Beautiful. Such a fabulous card Ashley! I love the lace trim. Really does give it that feminine touch. Ash - I also shared your giveaway on FB. 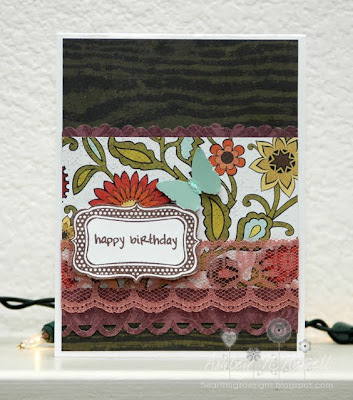 Hi Ashley,beautiful card,pretty paper and loving the layers! Congrats on your new DT, your card is adorable! What a beautiful card, love the fun papers along with the stamps you've used! Like the added lace as well. Congrats on your new DT!!! Love your card the lace makes it soo pretty! I am a follower of yours already so here another comment! I started to following MTE on facebook! Thx for so many chances to win! Love your card! Great layers and choice of the patterned papers. I just signed up to follow My Thoughts Exactly.... Thanks for the chance to win the sweet tag set... love it! I can see why it's a favorite! I love your card! Especially the lace! Think it adds that very feminine touch! I liked My Thoughts Exactly on fb. I follow the My Thoughts Exactly blog! Fabulous use of pattern and color! I already follow My Thoughts Exactly! I liked My Thoughts exactly on Facebook! Love all the layers on this card. Thanks for the chance at the giveaway! Lovely Card! I love the colors and the lace trim.